Avoid major issues by partnering with an experienced expo shipping company like AFP Expo Logistics! As you already know, trade shows and expos represent some of the best chances for you to grow your business, giving you access to new customers and helping to boost awareness of your brand within your field. We understand how critical digital and more conventional marketing efforts are to business, but there’s still something about that personal interaction with customers at an expo that can make quite an impression on them and be just as effective. However, that impression could be majorly detrimental to your brand if you’re missing items from your booth or come to the expo unprepared. And with all of the things you need to worry about when it comes to preparing and executing a successful trade show, it can be quite easy to lose something important in the mix. How can you cope with all of the stresses and processes necessary to have a good expo? Partnering with an expo shipping company like AFP Expo Logistics can help your business coordinate all of your expo shipping needs, saving you time, money, and a lot of headaches! There are three major problems, in particular, that we can help you avoid. It takes considerable time and effort to plan a great exhibit, not to mention a chunk of your expo budget to get all of the items to the expo site on time. So the last thing your business needs is to have your materials damaged, lost during transit, or not arrive on time. It can really put a strain on your expo team, but unfortunately this is not uncommon, and it can really put your expo experience in danger of being ineffective. In rare cases, it could be so bad that you might even have to cancel your exhibit! But when working with an experienced expo shipping company like AFP Expo Logistics, their main goal is to ensure all of your items arrive at the event site on time. You can trust us to deliver, as we have done for companies over the last two decades, so you can breathe easy and worry about more important things! Unfortunately, shipping a trade show booth is not quite as simple as sending one package to the show site. Your booth likely includes a wide variety of materials, consisting of different shapes, sizes, and weights. Without experience in the field, it’s really easy to pay too much for shipping, so you need a partner that knows how to get the most out of your budget. That’s where we come in! We know all the little tricks that can save your company money, and we’ve negotiated with carriers to get the best rates for your freight. We understand the most affordable ways to ship your various expo materials to the show site on time. 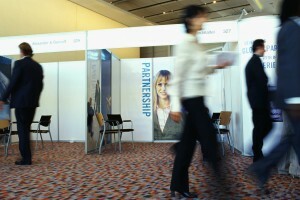 Trade show planning requires more than simply thinking about how to get your materials to the site. You have to think about the content of your booth, where your staff will be staying, and the best ways to network with potential clients. In addition, you need to make appropriate arrangements for storing your materials both before and after the expo, and this is something most businesses don’t even think about. But we do, and we can help your business store all of your critical materials in safe environment, whether that be directly at the show site or at an advanced warehouse. There are some pros and cons to each method, so one may be more beneficial to your business than the other. AFP Expo Logistics can help make sense of your options and give you all of the information you need to make the best storage decision for your business! This entry was posted on Friday, June 8th, 2018	at 10:28 am	and is filed under AFP Expo	. You can follow any responses to this entry through the RSS 2.0	feed. Both comments and pings are currently closed.